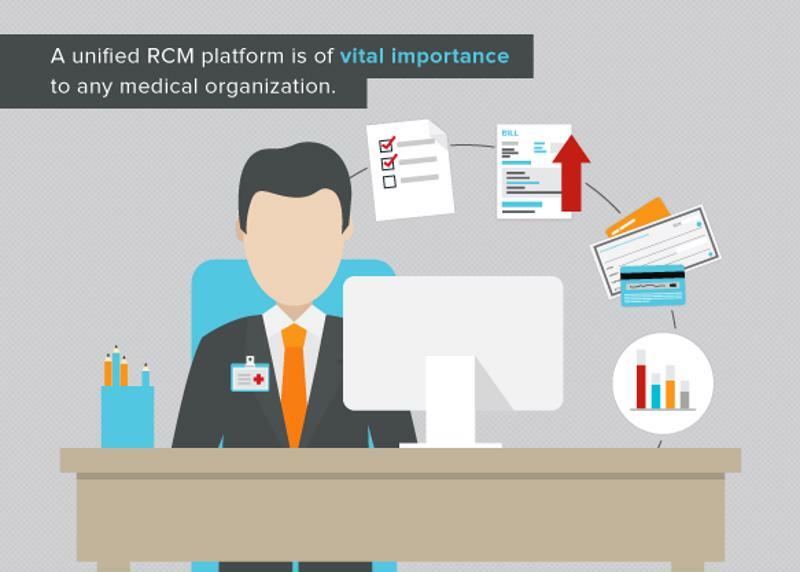 A unified RCM platform is of vital importance to any medical organization. There's no denying the immense value and importance of the worldwide healthcare revenue cycle management market. According to a report by Data Bridge Market Research, this segment should account for about $137 billion in revenue for healthcare providers by 2024. Services-based RCM makes up the bulk of this field and will account for $50.9 billion in earnings for these industry entities by 2024. The reason for this, of course, is the preponderance of issues that can present themselves within the context of any hospital, clinic or other major healthcare organization – particularly when operations have become improperly siloed and disconnected. "Problems can arise out of any siloing that separates front- and back-end operations in medical organizations." The key to eliminating such siloes lies with uniting RCM functions across both front- and back-end systems. Doing so can help administrators within these facilities bring a greater sense of efficiency and efficacy to all operations within the healthcare revenue cycle. Even better, unifying these operations can ultimately provide better experiences for both hospital staff and patients alike. On the surface, one can perhaps understand why front- and back-end hospital operations would be distinctly separated from each other, even solely within the RCM sphere. In the former segment, admissions, insurance coverage confirmation and other basic but essential information-gathering tasks take place. Meanwhile, the back end involves things that can be considerably more complex: medical billing on macro and micro scales, claims and denials management, and various other necessary financial interactions between healthcare organizations and patients or payers. The primary problem with keeping these two halves of RCM separate is the misunderstanding that the front end may have about the back end, and vice versa. As pointed out by RevCycleIntelligence, front-end staff in siloed situations won't necessarily know as much about claims processing. At the same time, those working in the back-end trenches can lose touch with the patient-facing tasks that require a measure of empathy and understanding for different patients' needs. Bringing them together, by contrast, can help all pockets of organizational staff expand their horizons and knowledge. Combining front- and back-end RCM leads to both greater ROI and more efficient organizational processes. Rebecca Wright, vice president of strategic planning at Iroquois Memorial Hospital in Watseka, Illinois, commented further on the problem of siloing and the advantages of bringing front- and back-end operations together, in an interview with RevCycleIntelligence. "In the past, it's always been focused on back-end or business office in collections, and we turned it on [its] head and looked at how we can push it more to the front end," Wright said. "Because we knew by pushing more of it to the front end, we could reduce overall costs for our organization and make outcomes a little bit better." In the case of Wright's hospital, administrators moved all back-end operations to the front. This gambit succeeded and allowed for greater understanding of not only individual accounts, but also the overall revenue cycle and how everything connects. Easy access to all pertinent patient and claims information serves as the catalyst to all successful healthcare RCM operations – specifically, the control of that data to glean the seeds of actionable strategies. There are numerous ways to capture and eventually utilize this data, and the specific choice of platform and methodology will vary between healthcare organizations. According to Becker's Hospital Review, blockchain has emerged as a common technique for streamlining RCM, due mainly to its potential for predictive action. But implementing a new technology like blockchain may not be the right call for every healthcare provider. What's most important is the ability to acquire all essential patient information – personal, financial and everything in between – at registration. Additionally, adopting a solution in which patient information can easily be matched with data from that individual's employer can provide further organization and efficacy to the process.